This is for every parent who has lost a child by “getting help” for their children when all that happened was the “system” murdered their child with an antidepressant known to DOUBLE their chances of suicide! PLEASE SHARE BUT ONLY DO SO WITH THE WARNINGS BELOW ON THE EXTREME DANGERS OF RAPID WITHDRAWAL!!! Why would I use the term “murdered” or even pre-meditated murder”? I do that because after working since 1992 as an expert in court cases involving these drugs I am aware of internal company memos in which their own scientists warned them these drugs were actually causing suicide! And the company’s written memo in response to those scientists was that company could not afford to lose their antidepressant so the scientists would have to tell people that these suicides were being caused by an “underlying depression”, not their new antidepressant – their precious Golden Goose! And I am also keenly aware of court testimony by their own pharmaceutical experts in a mass murder/suicide that when you chemically interfere with the metabolism of serotonin, which is what they admit these antidepressants are designed to do as “serotonin reuptake inhibitors.” They inhibit the metabolism of serotonin. And when you inhibit the metabolism of Serotonin, thus causing it to build up in the brain, you should EXPECT TO PRODUCE IMPULSIVE MURDER OR SUICIDE as an end result according to decades of research! NYTimes: Help! I Can’t Get Off My Antidepressant! REMINDER: US SUICIDE RATE AT ALL TIME HIGH – ANYONE SURPRISED??? If these statistics say nothing else, they at least make it clear that antidepressants do not work. And apparently the only ones surprised by this are the so called “experts” in suicide who have vested interests in Pharma and are therefore, turning a blind eye to statistics that have been starring them in the face for decades. Anyone familiar with my work on the dangers of antidepressants have expected this for some time now &amp; witnessed it all around them. I encourage you to read this to see how bad it has become and before doing so I am going to share with you the testimonies of two of my good friends who testified to the FDA in 1991 that this was happening as a direct result of Prozac – the mother drug of this whole new generation of SSRI and SNRI antidepressants. We now have dozens of prescription drugs on the market which have warnings that they cause suicide. We have antidepressants, atypical antipsychotics, acne medications, asthma medications…the list is so very long! Even Tamiflu was removed from the market in Japan due to the suicides from that drug. Anyone familiar with my work on the dangers of antidepressants have expected this for some time now & witnessed it all around them. I encourage you to read this to see how bad it has become. but before doing so I want you to see the video testimonies of two of my good friends testifying before the FDA in 1991. They warned that these suicides were increasing drastically as a direct result of Prozac – the mother drug of this whole new generation of SSRI & SNRI antidepressants & atypical antipsychotic drugs. We now have dozens of prescription drugs on the market which have warnings that they cause suicide. We have antidepressants, atypical antipsychotics, acne medications, asthma medications…the list is so very long! Even Tamiflu was removed from the market in Japan due to the suicides from that drug. And about everyone in this country has access to a drug pusher they see regularly who they refer to as their personal physician while nurses share that 75% of the physicians and nurses they work with take antidepressants. Second is Maria Malakoff, a Florida pharmacist, testifying about both her own suicide attempt on Prozac and the suicide of her husband, also a pharmacist. Maria warned the FDA back in 1991 that the day would come that every family in America would be affected by antidepressants if they did not issue warnings back then. Tragically her statement has proved prophetic! “It’s really stunning to see such a large increase in suicide rates affecting virtually every age group,” said Katherine Hempstead, senior adviser for health care at the Robert Wood Johnson Foundation, who has identified a link between suicides in middle age and rising rates of distress about jobs and personal finances. Researchers also found an alarming increase among girls 10 to 14, whose suicide rate, while still very low, had tripled. The number of girls who killed themselves rose to 150 in 2014 from 50 in 1999. “This one certainly jumped out,” said Sally Curtin, a statistician at the center and an author of the report. American Indians had the sharpest rise of all racial and ethnic groups, with rates rising by 89 percent for women and 38 percent for men. White middle-aged women had an increase of 80 percent. The rate declined for just one racial group: black men. 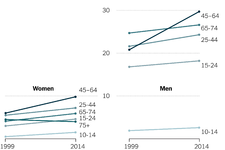 And it declined for only one age group: men and women over 75. The data analysis provided fresh evidence of suffering among white Americans. 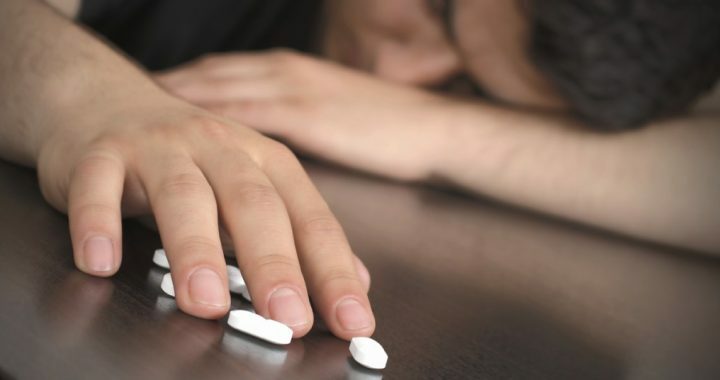 Recent research has highlighted the plight of less educated whites, showing surges in deaths from drug overdoses, suicides,liver disease and alcohol poisoning, particularly among those with a high school education or less. 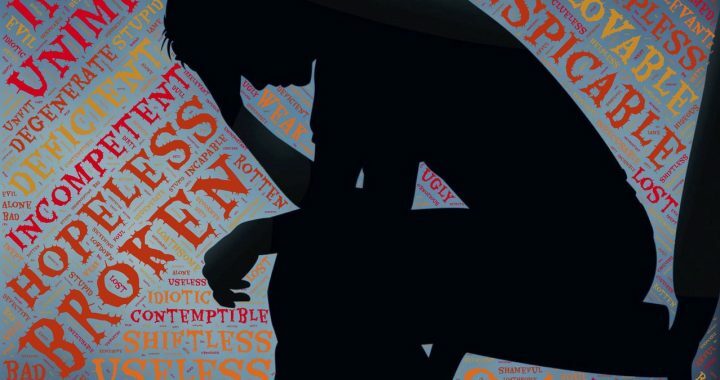 The new report did not break down suicide rates by education, but researchers who reviewed the analysis said the patterns in age and race were consistent with that recent research and painted a picture of desperation for many in American society. “This is part of the larger emerging pattern of evidence of the links between poverty, hopelessness and health,” said Robert D. Putnam, a professor of public policy at Harvard and the author of “Our Kids,” an investigation of new class divisions in America. The rise in suicide rates has happened slowly over many years. Federal health researchers said they chose 1999 as the start of the period they studied because it was a low point in the national suicide rate and they wanted to cover the full period of its recent sustained rise. The federal health agency’s last major report on suicide, released in 2013, noted a sharp increase in suicide among 35- to 64-year-olds. But the rates have risen even more since then — up by 7 percent for the entire population since 2010, the end of the last study period — and federal researchers said they issued the new report to draw attention to the issue. Policy makers say efforts to prevent suicide across the country are spotty. While some hospitals and health systems screen for suicidal thinking and operate good treatment programs, many do not. She noted that while N.I.H. funding for suicide prevention projects had been relatively flat — rising to $25 million in 2016 from $22 million in 2012 — it was a small fraction of funding for research of mental illnesses, including mood disorders like depression. The new federal analysis noted that the methods of suicide were changing. About one in four suicides in 2014 involved suffocation, which includes hanging and strangulation, compared with fewer than one in five in 1999. Suffocation deaths are harder to prevent because nearly anyone has access to the means, Ms. Hempstead said. And while the share of suicides involving guns declined — guns went from being involved in 37 percent of female suicides to 31 percent, and from 62 percent to 55 percent for men — the total number of gun suicides increased.. The question of what has driven the increases is unresolved, leaving experts to muse on the reasons. Julie Phillips, a professor of sociology at Rutgers who has studied suicide among middle-aged Americans, said social changes could be raising the risks. Marriage rates have declined, particularly among less educated Americans, while divorce rates have risen, leading to increased social isolation, she said. She calculated that in 2005, unmarried middle-aged men were 3.5 times more likely than married men to die from suicide, and their female counterparts were as much as 2.8 times more likely to kill themselves. The divorce rate has doubled for middle-aged and older adults since the 1990s, she said. Disappointed expectations of social and economic well-being among less educated white men from the baby-boom generation may also be playing a role, she said. They grew up in an era that valued “masculinity and self-reliance” — characteristics that could get in the way of asking for help. “It appears this group isn’t seeking help but rather turning to self-destructive means of dealing with their despair,” Professor Phillips said. Another possible explanation: an economy that has eaten away at the prospects of families on the lower rungs of the income ladder. 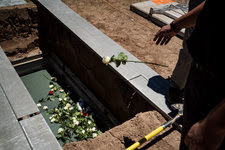 Dr. Alex Crosby, an epidemiologist at the Centers for Disease Control and Prevention, said he had studied the association between economic downturns and suicide going back to the 1920s and found that suicide was highest when the economy was weak. One of the highest rates in the country’s modern history, he said, was in 1932, during the Great Depression, when the rate was 22.1 per 100,000, about 70 percent higher than in 2014. But other experts pointed out that the unemployment rate had been declining in the latter period of the study, and questioned how important the economy was to suicide. The gap in suicide rates for men and women has narrowed because women’s rates are increasing faster than men’s. But men still kill themselves at a rate 3.6 times that of women. Though suicide rates for older adults fell over the period of the study, men over 75 still have the highest suicide rate of any age group — 38.8 per 100,000 in 2014, compared with just four per 100,000 for their female counterparts. As you can see from the picture of Manuela she obviously attempted to take her own life as well by cutting her own throat. So this was a murder/suicide attempt. Additionally … “A police source said Rodriguez stuffed a sock in the girl’s mouth, struck her in the head with a pipe wrench, then cut her neck and shoulder with the circular saw. She then cut her own neck with the saw. Before the SSRIs and SNRIs hit the market it was extremely rare to ever hear of a mother killing a child but grandmothers killing a grandchild was unheard of before these drugs……and especially as violent as these cases are! I have never been capable of watching a horror movie…..yet for 25 years now I have been documenting the reality horror movie we live in at www.ssristories.NET How horrific does this drug-induced nightmare need to become before we wake up to the cause and do something about it?!!!! I am grateful that the Chicago Sun Times still has an air of correct reporting after my dear friend Barbara Mularkey (whose part was played by Julia Roberts with Nick Nolte in the movie about Barbara “I Love Trouble” about her uncovering the Bovine Growth Hormone in milk – a cancer causing chemical) worked as an investigative reporter for many years. If more news media would just report the facts the public would be better informed of the dangers of these deadly drugs! Can identifying mental illness stop terror attacks? NO!! Can identifying mental illness stop terror attacks? No, it would add gasoline to the raging fire which their so called “treatments” for mental illness (antidepressants and atypical antipsychotics which mimic PCP or LSD) have created. These are the drugs they have been handing out for the past almost three decades starting when this type of violence began to escalate. We know that 7% – 10% of the population genetically do not inherit the liver function to metabolize these drugs. So for them toxic reactions come quickly. 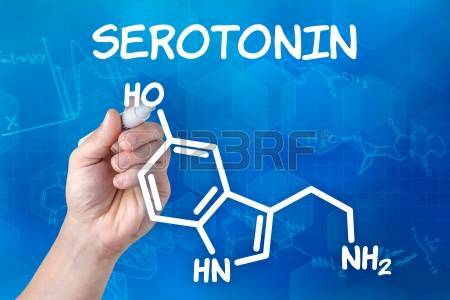 Selective Serotonin Reuptake Inhibitors (SSRIs or SNRIs) inhibit the re-uptake of serotonin in order to force it to accumulate in the brain, even though this is the same neurotransmitter that LSD and PCP mimic to produce their hallucinogenic effects. So as an antidepressant gradually causes the serotonin to build up, the elevated levels of serotonin begin to produce LSD and PCP effects such as hallucinations, psychosis, and violence, as demonstrated in much medical research. USC has some excellent research demonstrating the extreme violence this elevation of serotonin can produce. LSD was patented in a synthetic version by Eli Lilly, the makers of Prozac, in 1956. PCP was on the market as an anesthetic for seven years before judges and law enforcement (not the AMA or FDA) insisted it be removed due to the violence it was producing. Luckily it was mainly given in a controlled hospital setting rather than being handed out freely by every doctor in town as antidepressants have been. 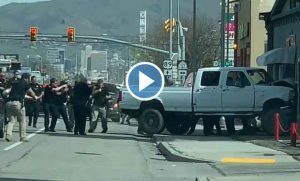 So obviously the earlier a mental illness is identified, the more individuals we will have on drugs that produce this type of violence. 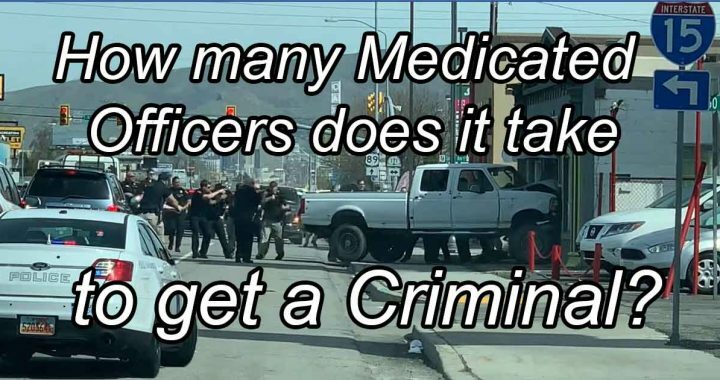 Of course the question can easily be answered with one database of almost 5000 cases of violence with documentation of the medication they were taking: www.ssristories.NET. After reading this I doubt that you will ever look at an animal the same way again. Just because they cannot speak, does not mean they do not think and feel much the same way we do. (Keep in mind that animals have long been given antidepressants and are used in testing for prescription drugs and makeup, etc.) People tend to distance themselves from animals in many ways in order to excuse what we as a society do to them. In doing so I believe we are prevented from seeing how deeply animals feel compassion and the same feelings we have for our loved ones which they clearly experience right along with us along with their ability to have deep conscious thought processes. This is the story of Washoe and her adopted son, Loulis who learned sign language and could, therefore, communicate all of these thoughts and feelings. The insight this will give is astounding as she shows such compassion for her trainer who has lost a child! And then her adoption of a baby monkey and her teaching him to sign on her own! It will touch your heart and open your mind!